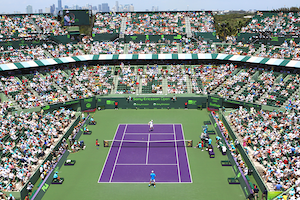 The coveted stadium court at Crandon Park Tennis Center in Key Biscayne, Florida, home to the annual “Fifth Grand Slam,” will see a unique transformation from the traditional purple and green colors – a complete makeover that will be created especially for the Miami Tennis Cup. Spectators will witness world-ranked players slugging it out on the first ever white stadium court, complete with red lines, painted within a blue area that will surround the court. The first red, white and blue stadium court will be developed purposely for the three-day tournament, to commemorate the emblematic colors of our nation’s flag. The tournament will see all six players competing in a double-elimination tournament format within two round robin groups. Each match will be the best of three sets. The number one seed (Andy Murray) and number two seed (Andy Roddick) will receive an automatic bye in to the semi-final. The remaining four players will be drawn against each other for a place in the semi-final, with the initial matches starting on stadium court at 7:00pm on Friday, November 30th. The first semi-final match will commence on stadium court at 5:00pm on Saturday, December 1st. The emerging winner from Sunday’s final will take the coveted title as the first ever champion of the Miami Tennis Cup, for which a cash prize and trophy will be presented on stadium court by a surprise celebrity legend from the world of tennis. On Saturday, December 1st and Sunday, December 2nd, a USTA sanctioned 12 and Under tournament will take place, starting at 8:00am until 3:00pm, as part of a weekend-long Family Day series of fun-filled activity, taking place on courts one and two. Parents are invited to register their kids on-site at Crandon Park Tennis Center. To commemorate the inaugural year of the Miami Tennis Cup, additional events outside Key Biscayne will include an official VIP Dinner, followed by an invitation-only Players Party, taking place in Miami Beach at the Official Hotel for the Miami Tennis Cup, on the evening of Saturday, December 1st. Tickets for the first annual Miami Tennis Cup, taking place November 30th – December 2nd, at Crandon Park Tennis Center in Key Biscayne, FL., are now available through Ticketmaster starting at $50 (general admission). A three-day pass starts at $118 (300 Level – general admission). Tickets prices may vary and are subject to availability. Miami Tennis Cup has formed an inaugural partnership with the non-profit charity organization Shake-A-Leg Miami and a portion of all proceeds from tickets sales will be donated to Gulliver schools. For further information and for frequent updates on the first annual Miami Tennis Cup, visit www.miamitenniscup.com and www.facebook.com/miami-tennis-cup or follow on Twitter @miamitenniscup. The 2012 Miami Tennis Cup is produced by Group NOS in association with CMN Sports.